20 Years Ago, De La Soul Refused To Go Pop : The Record De La's third album, Buhloone Mindstate, challenged the music industry — an industry then obsessed with hip-hop's crossover success — and went on to become a classic. David Jude Jolicoeur aka Trugoy (from left), Vincent Mason aka P.A. Mase and Kelvin Mercer aka Posdnuos pose for a portrait outside the Apollo Theater in Harlem in September 1993. This year marks the 20th anniversary of a remarkable year in music. Over the 12 months of 1993, Queen Latifah, Salt 'n' Pepa, Snoop Dogg, A Tribe Called Quest, the Wu-Tang Clan and more than a dozen other rappers released albums that helped to change the sound of America. Among them was a record by De La Soul that challenged the music industry — an industry then obsessed with taking hip-hop to the mainstream. The album is now considered a classic. When the three members of De La Soul began work on Buhloone Mindstate, they had pretty much had it with the music industry, says David Jolicoeur aka Trugoy, one of the group's two MCs. "We had been through the 'machine,' " he says. "I think we were truly burnt out." Trugoy, along with group mates Posdnuos and P.A. Mase, scored a major success with De La's 1989 debut, Three Feet High and Rising. The trio immediately established itself as one of hip-hop's most eclectic and creative groups, especially in their storytelling, says journalist and filmmaker Raquel Cepeda. "They upped the ante for other people to tell wonderful stories through their music," she says. "For example, Wu-Tang Clan — who you wouldn't necessarily put in the same category, if you will, with De La Soul, but at the same time, they kind of set it up." But two years later, the musicians killed off their happy-go-lucky hip-hop hippy personae on the followup De La Soul Is Dead. The album surprised De La's label, Tommy Boy Records. Dante Ross originally signed the group. 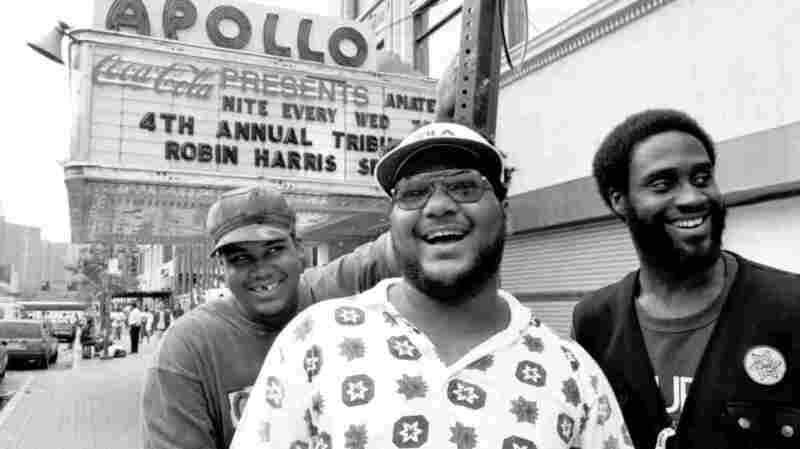 "I always think that De La Soul is the first sardonic group in hip-hop. You know, cynical, without malice," says Ross. "They saw the ridiculousness in the culture of rap music." By 1993, what some fans and most labels wanted were songs with crossover appeal. With Buhloone Mindstate, De La Soul went in the opposite direction — throwing listeners for a loop by recording a song with Takagi Kan and SDP rapping in Japanese — no subtitles, no translations. "We went to Japan and experienced hip-hop that we could not understand one bit, but felt a flow, felt something that made us feel like, 'Wow! These guys are amazing!' " says Trugoy. "Not knowing what they were saying, what they were talking about, but you felt the energy and you felt that they had it." The album also included the candid "I Am I Be." The song was an accident of sorts, says producer Paul Huston, aka Prince Paul. "'I Am I Be' — I actually made for myself," he says. "The guys came by the house one day and I was just playing music, and I kind of passed through that one. They were like, 'Yo! What's that?' 'Eh, that's not really for you guys. Let's go to the next one.' They was like, 'No no no, what is that?' And they said, 'Yeah, we want to write it and use it for the album.' I was like, 'Are you sure?' "
It was a song that resonated with Kelvin Mercer, aka Posdnuos, the group's other MC. "When I actually heard his lyrics in the studio," says Prince Paul, "it sent a chill down my spine. I was like, 'Whoa, this is — you took it someplace I didn't really think it could go.' "
Buhloone Mindstate was lauded by critics when it came out. Cepeda remembers being impressed. "Buhloone Mindstate proved that they can continue to reinvent themselves," she says. "Especially at that time, it was really difficult to be able to release an album that is really so brutally honest." It also set the group apart, says former label exec Ross. "It kind of made them — it's weird to say — almost like an alternative rock band. Like, they kind of stood outside of hip-hop." The album took awhile to catch on with fans, according to Posdnuos. "I've had fans who will come up to us, you know, way after Buhloone Mindstate had came out, and they all say, 'You know what? I remember when that came out and what you guys had already given us previously, I didn't really get it.' You know, but, 'When I had my first kid,' or 'When I got a little older,' 'Yo! When I went back to that album, it really appealed to me more than when it first came out.' "
In other words, Buhloone Mindstate was a slow-burner. "It's just like an incense that burns slowly," says Pos, "and even after it's finished burning, the smell and what it has left is still there, as opposed to something that's coming in and blowing up, and then when it blows up, it's kind of over." Maybe back in 1993, Buhloone Mindstate was too far ahead of its time, but in the 20 years since, it seems everyone else has finally caught up.